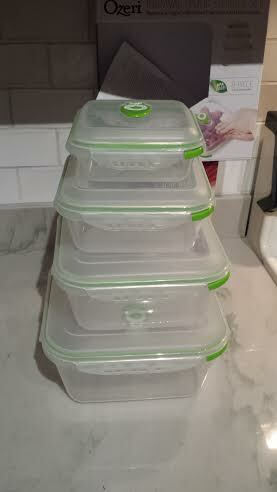 I received Ozeri INSTAVAC Green Earth Food Storage Containers to facilitate my review. All opinions are mine. Whether you have a big or small family at home it is important to eat fresh and healthy foods on a daily basis. Now unless you have the time to shop at the supermarket every day you will find yourself stocking up on items for use during the week. When it comes to fruits, vegetable, and left overs you want to be able to keep them fresh and tasty. I can’t count how many times I had to throw out half a head of lettuce or some raspberries because they got moldy and gross from being in the refrigerator too long. One of my favorite fruits strawberries are quite susceptible to mold growth and can start going bad after 3-4 days in the fridge. This is unfortunate when you consider the price of fresh produce these days. In order to keep my fruits and vegetables fresh longer I’ve been looking into a variety of methods. Some people swear by zip lock plastic bags. They say that they keep a variety of bag sizes and use them for fruits and vegetables. I guess this can work but then you end up wasting money on all of the plastic bags. This is also not the most eco-friendly method out there. Another method that I came across was using plastic containers to keep produce fresh. I mean Tupperware has been around since before I was born so it must work. Recently I was introduced to a company that promises to make the “worlds most effective vacuum-sealed food container set”. Their words not mine. The product is called the Ozeri INSTAVAC Green Earth Food Storage Containers. They can be found on Amazon for $24.95 by visiting this link Ozeri Food Storage Containers. They describe their product as BPA-Free 8-piece nesting set with vacuum seal and locking lids. They sent me a set of their containers recently for me to test out and review. 4 containers and 4 lids. When the containers arrived I was impressed with the quality and sturdiness of the plastic, especially the lids. The lids were very interesting because they come with two features that I haven’t seen on plastic containers before. The first feature is a dial with numbers on them. The numbers represent the days of the month and you turn the dial to the day you put the food into the container. The second feature is the valve system that allows you to see when you are removing all of the air from the container. Basically you close the container and then gently press on the lid. You will hear a slight air sound as air is expelled from the containers. Then you will visibly see a circular piece of small green rubber get sucked in showing that there is no more air in the container. Around this rubber is a plastic valve that can be released by lifting it upwards. When you do this you hear a swishing sound as air returns to the container. The benefit of this type of lid is that you can visibly see when air is removed from the container. You can also tell when you put the food in the container so you can see how fresh it really is. The people over at Ozeri Food Storage Containers told me that their product was better than other plastic containers out on the market at keeping foods fresh. I decided to come up with my own challenge to see how they stood up to that claim. I found an old cheap plastic container in my cabinets; you know the type that they give you at a Chinese food restaurant? They are circular with a white plastic bottom and a clear plastic top. 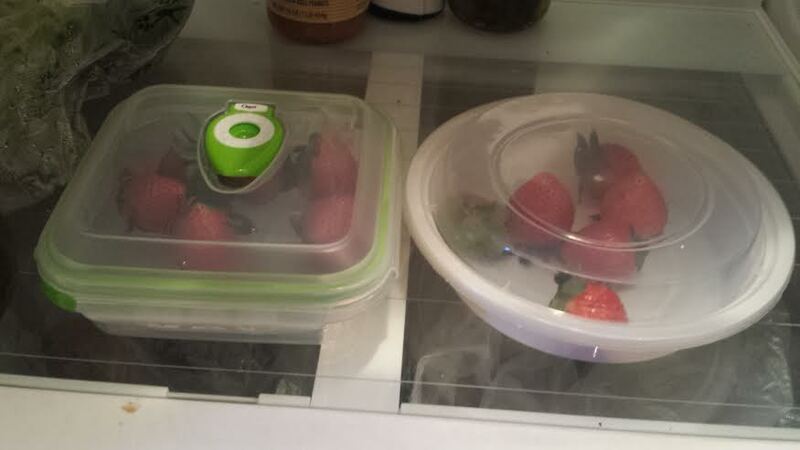 I placed 6 fresh strawberries in both the Chinese food container and the Ozeri Food Storage container. I then did my best to get rid of all of the air in the Chinese food container as I sealed it shut. I did the same for the Ozeri container as well. I marked my calendar on November 20th and put them in the back of the fridge. My plan was to leave them in the fridge for 12 days and see which container kept the strawberries fresher. After around 8 days I started to get a bit curious and decided to take a peek at the containers. They both seemed all right. Visibly I could not see anything wrong with the strawberries inside. I did notice that the Ozeri container seemed to be taking on air. Or at least that’s what the vacuum seal indicated. I pushed down on the top of the container to remove any air inside. Its possible that there were other gases present other than oxygen. I decided to press on and wait another 4 days before opening the containers. On the twelfth day on December 2nd I gathered my kids around to show them the results of the experiment. 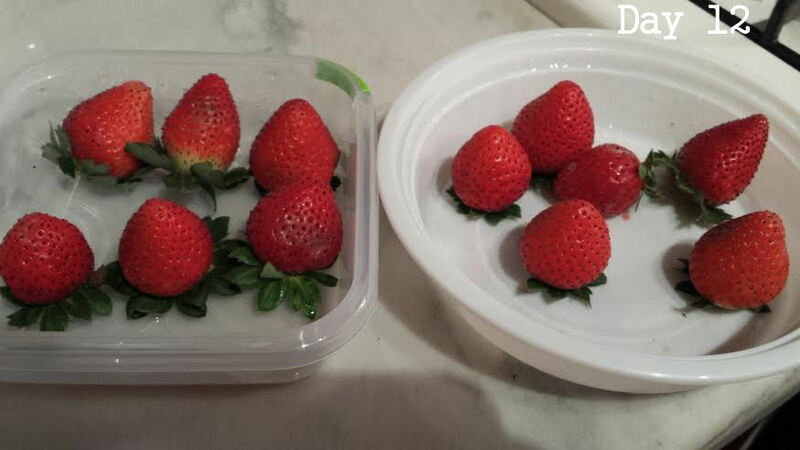 After opening both food storage containers the strawberries inside appeared to be fresh and healthy. Upon closer inspection there were strawberries in both containers that had small amount of mold on them. 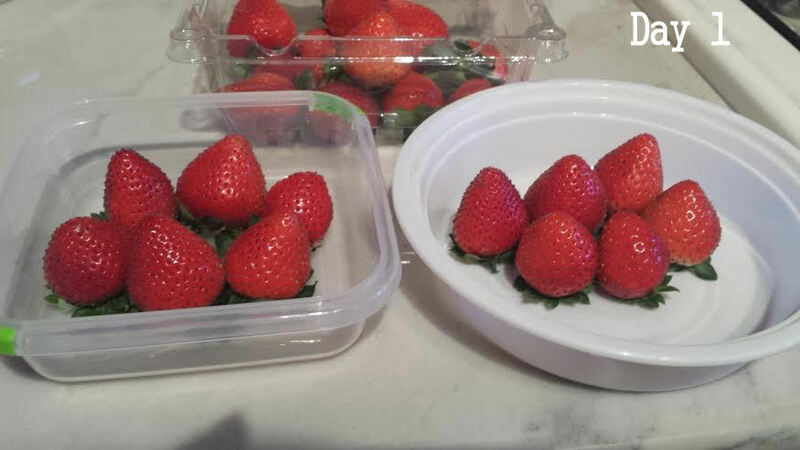 The strawberries in the Chinese food container also appeared to be redder than those in the Ozeri container. I then washed the strawberries and cut them up for the taste test part. The strawberries from both containers were a little bit mushy and weren’t as flavorful as fresh ones. Both groups smelled fresh and still tasted pretty good. Especially for strawberries that have been sitting in the refrigerator for 12 days. Overall both containers did a pretty decent job at keeping the fruit fresh. I wouldn’t recommend keeping strawberries for 12 days like I did but 5-8 days would be good. Remember always visibly check and smell your food before eating. In conclusion I have to say the average cheap plastic container like mine did just as well as the Ozeri INSTAVAC Food storage container at keeping my strawberries relatively fresh. I know one thing for sure if they would have been in a regular strawberry container there would have been mold all over them after 12 days. 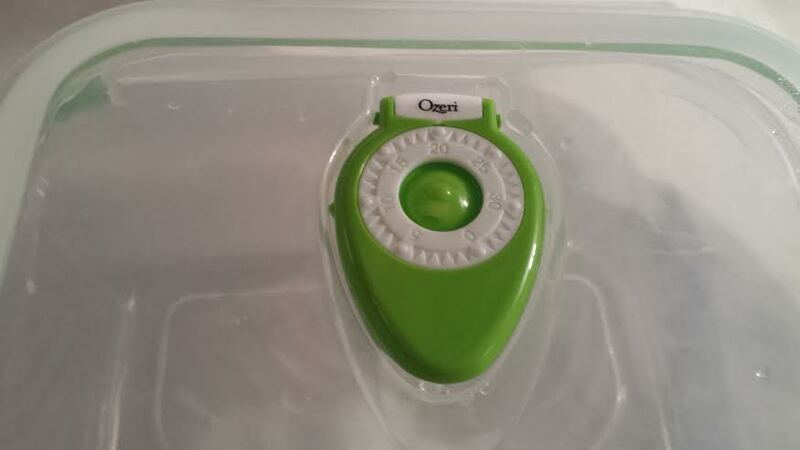 So bottom line the Ozeri Instavac Food storage containers work but so do everyday plastic containers. Strawberry is not a good choice!